#WhatBringsPeace is an all inclusive, worldwide, philanthropic art project, that explores the pan-human quest for peace on individual and collective terms in response to increasing violence, environmental threats, and political extremism experienced globally today, making this project timelier than ever. „Peace in its complexity can’t have a final result or statement. It’s an ongoing, ever changing process, a balance that can’t be understood without the reflection on war at the same time than peace. #WhatBringsPeace goes far beyond the topic of peace and war. #WhatBringsPeace is about individual and global reflections of whom we are, of how we act on a daily base as well as on a global scale. #WhatBringsPeace is about raising awareness on fundamental questions of identity, roots, globalization, unification, peace and war. The aim is to raise awareness on the everlasting bond of all human kind: emotion. As our society tries to distract us and tears us away, cuts us off willingly and with all power from our emotions through media, consumerism or even pharmaceutical „support“, through political games and manipulation we are dragged away from our identity of who we are and what we feel. Roescheisen’s artistic body of work focuses above all on human emotions. She uses Art as a universal language to break down barriers of elitist thinking, social, religious or political boundaries. The artist believes that emotions are the unified aspect of all humans. Our experiences that lead us to joy, pain, anger, frustration, laughter, destruction, to suffering, anxiety, construction and above all to love – might be different, as well the languages, social challenges, political situations and health terms are different, but the essence of emotions is equal to all of us. We are cry, we all suffer, we all laugh and we all love. 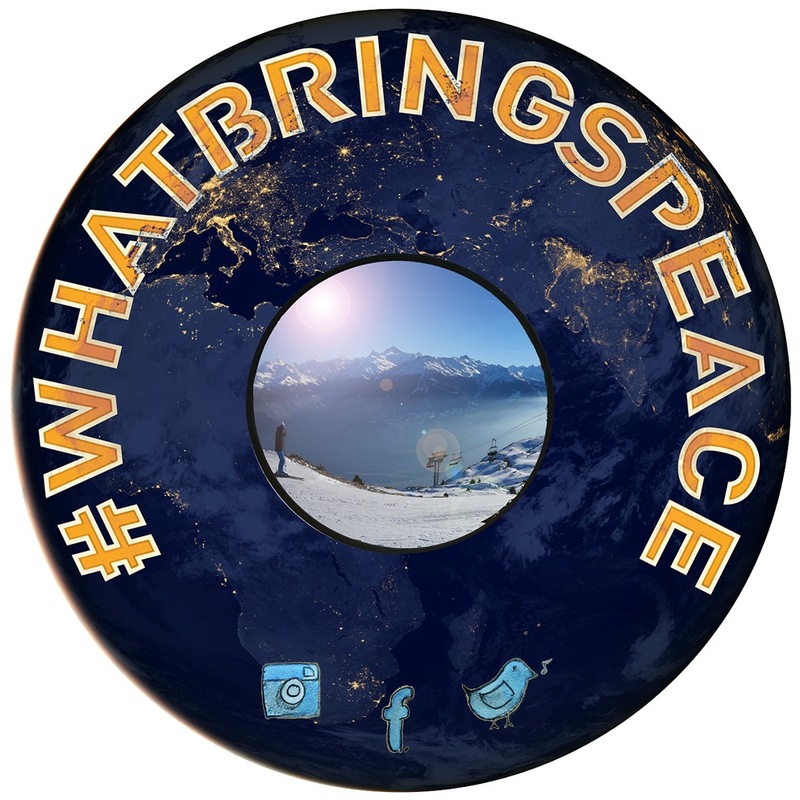 #WhatBringsPeace is an ongoing interactive project that envisions a general reflection on war and peace on individual and global terms. This philanthropic art project aims to go beyond language, religions, politics or social positions in order to observe and point out what is most evident to the artist: our unity of all human kind and race in our emotions. #WhatBringsPeace tries to point out and underline the emotive universal human connection and on the other hand calls out for reflection, self-observation and action amongst all humans. The project was created and conceived by the artist in May 2016. Since February 2017, the project has engaged people through a traveling, interactive sculpture, social media, and video interviews on the topic of peace, held by the artist all over the world, as well as the artist’s participation in conferences and panels. Furthermore individuals can also participate through the usage of the hashtag (#WhatBringsPeace) and their sharing of thoughts and propositions through social media. Roescheisen explores the quest for peace on individual and collective terms, as well as the dimension of individual and global war through these diverse mediums. #WhatBringsPeace is an ongoing fieldwork project, an ethnographical approach in the search to find solutions, propositions and above all to raise awareness on the current state of the world. Whereas our society mostly aims for results, Roescheisen underlines, that the path to get there is the main focus. Therefore #WhatBringsPeace has no final project date set. The structure is given through the 5 elements: social media, a traveling sculpture, sharing through the participation in conferences and artist panels, as well as ongoing interviews and their broadcast and most important YOUR interactions, reflections and engagements. The sculpture consists of a large-scale street sign (2m diameter) and of a recto and verso side. The recto side is depicting an image of the Earth with a convex mirror at its center, social media icons at the bottom, and the #WhatBringsPeace hashtag/ question written at the top. The mirror, reflecting both the viewer and his/her surroundings, fosters the idea of the self in relation to others. The sculpture encourages participants to ask themselves the question ‘What Brings Peace/ War?’ both as an individual and on a global scale. The social media icons at the bottom of the sculpture invite viewers to share their messages through social media platforms (Twitter, Instagram, Facebook, Vimeo). The posts are constantly re-posted and credited on the active #WhatBringPeace social media accounts. These posts are meant to capture a variety of cultures and environments, often highlighting the minutia of day-to-day life. The back-side is rusted and consists of hundreds of empty bullets, placed around the centered mirror; the mirror is brass, rusty, yet polished and reflects a shadow of the individual and the environment. The bullets refer to war, and the millions of murdered people worldwide. The itinerant sculpture has been launched in February 2017 in the Swiss Alps, in Crans Montana, in collaboration with the Frank Pages Gallery (Geneva) and the VAF (Vision Art Festival). The artist chose Switzerland as a host country as it is one of the regions with the longest periods of peace, closest to her place of birth, Munich. The aim is to continue the exhibition of the sculpture in public places, exhibitions, events and spaces, diverse cities and countries. The sculpture’s wandering existence stands in parallel to the artist’s own belief in the inclusive nature of world citizenship. A simplified version, the reverse side of the sculpture (same dimension of 2m diameter) is used by the artist as a round table at conferences and on panels in order to foster a dialogue and the notion of unity in discussion. The artist is reflecting on the question of the panhuman quest of individual and global peace and war by the encounter of diverse individuals all over the world, in the form of interviews, held by the artist. These interviews showcases people from diverse backgrounds and with different voices from all over the world, both famous and ordinary people. The implication of ALL individuals from all social backgrounds, religions and social standings is a key element of the artist, in order to raise different voices and underline our diversities as well as shedding light on our similarities. Roescheisen has interviewed 60 people so far worldwide. Furthermore Roescheisen implicates a more video art-based artistic approach by conceiving non-verbal interviews. Non-verbal interviews are defined for example as dance performances or musical compositions on the same topic of peace. Musical support so far in the form of compositions include: Laurent Levesque, Emmett Skyy (verbal and non-verbal), The Shoes and Jean-Benoît Dunckel (AIR). Social Media is used as a tool to amplify the reach of the message and to promote a sense of connectivity on a global scale by removing the boundaries of time, language, and location. The social media aspect gives all followers and participants the possibility to engage in the project on a daily basis, to dialogue and express themselves. Furthermore it is used to promote humanitarian causes, share voices, stories, as well as reflections of the artist herself and others. The content of #WhatBringsPeace is constantly crowdsourced, shared, and reposted via social media platforms. Peace, being a current urgent and important matter of concern worldwide, the artist’s participation in conferences and artist panels, and a close collaboration with Ngo’s, Foundations and Organisations are being fostered. As #WhatBringsPeace is an all inclusive project, shedding light on the impact of art and culture in a peace building process on a political, social and human scale, the artist supports public sharing through conferences and sees it as an important contribution to peace building processes. Art and culture have an important standing in the peace building process and therefore their place and voice in politics, religions, social contexts, without neglecting of the individual. Where governments and institutions tend to objectify, art subjectifies and reminds us about the human aspect and our emotions, which are necessary and important in a peace building process. …and most important YOUR interactions, reflections, engagements, your openness and willingness to dig into yourselves and having the courage to share your struggles and achievements with us through all channels: emails, interviews, and participations through social media and attendance of the conferences and panels. This art project has been conceived by the German multimedia artist Annina Roescheisen.